Sprinkler Solutions offers a full range of irrigation system services, repairs, and maintenance plans for your home and business, including sprinkler system startup, winterization, and mid-season efficiency inspections. 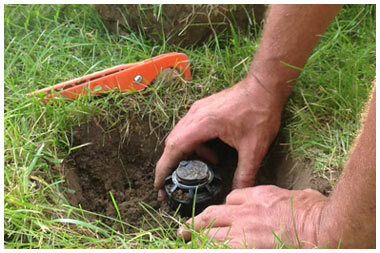 We are equipped with state-of-the-art locating devices to track underground irrigation mainline, valves, and wire, which is beneficial for zone additions, reroutes, or altering your property. Sprinkler Solutions can provide a complete design and installation package when utilizing on-site alternative water sources such as wells, ponds, or lakes. Integrating the correct design and installation, appropriate pump, filtration, and treatment, this is an extremely efficient, cost effective, and very environmentally supportive means to irrigate your landscape. We also offer pump repair and replacement. We are experienced in the design and installation for greenhouses and nurseries, ensuring your specified plants will receive the proper hydration. We have the experience and knowledge to provide you the right Sprinkler Solutions for your property. Providing residential and commercial irrigation services, irrigation system installations, and lawn sprinkler services. You can count on continuous support, as we are here to professionally service irrigation systems in The Miami Valley, Greater Dayton, and Cincinnati Ohio areas. Contact Sprinkler Solutions today for an Estimate on your next Irrigation Project. Copyright © 2019 Sprinkler Solutions Irrigation. All Rights Reserved.